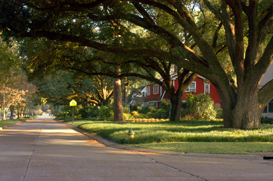 The Saints Streets homes are known for their southern charm and wide ranges of architectural styles. Many homes have original wood floors, cathedral ceilings, stained glass windows, front porches and more. These homes are inviting and comfortable yet sophisticated. A place to call home. A quiet stroll down the street offer locals dining options at The Saints Street Inn, Old Tyme Grocery, Champagne’s Market and more! The Saint Streets are also home to students attending the University of Louisiana at Lafayette. Some homes offer students a brisk walk though the oak lined streets with easy access to campus, the Cajun Dome, Cajun Field and Blackham Coliseum . Take a quick bike ride to Downtown Lafayette, the epicenter of Cajun Culture. Downtown Lafayette has something for everyone. From local eateries such as Pat’s Downtown, Agave, The Filling Station, Tsunami, and more to shopping and entertainment options, the Downtown area is in the heart of our vibrant community. Downtown Lafayette is also the home of Down Town Alive, Festival International, and many other music venues.